My wife Larissa and I were invited taking part at the Consecration of Bishop Sr. Sarah Groves, Moravian Church (Herrnhuter) in Gracehill, Ballymeena, Northern Ireland. It was a lovely service with a lot of singing and I was officially invited to take part in my black “pastoral” robe, representing the Lutheran Church and to greet Sarah. The Moravian Church has Bishops, but they are not “above” the other clergy, they are beside all pastors and members, doing pastoral work for the pastors and telling the gospel as everybody is doing that. They are not bound to a specified territory, only to the Province, which has one up to four bishops in the same time. The election of a Bishop takes place in the Synod of the Province. There is no discussion and no panel with candidates! After somebody suggested an election it starts. In this case after three rounds Sr.Sarah was elected – and surprised. If it happens that after many election rounds no clear majority for one of the pastors occurs, the Synod postpones the election: The Holy Spirit says it is not the time yet for the election. 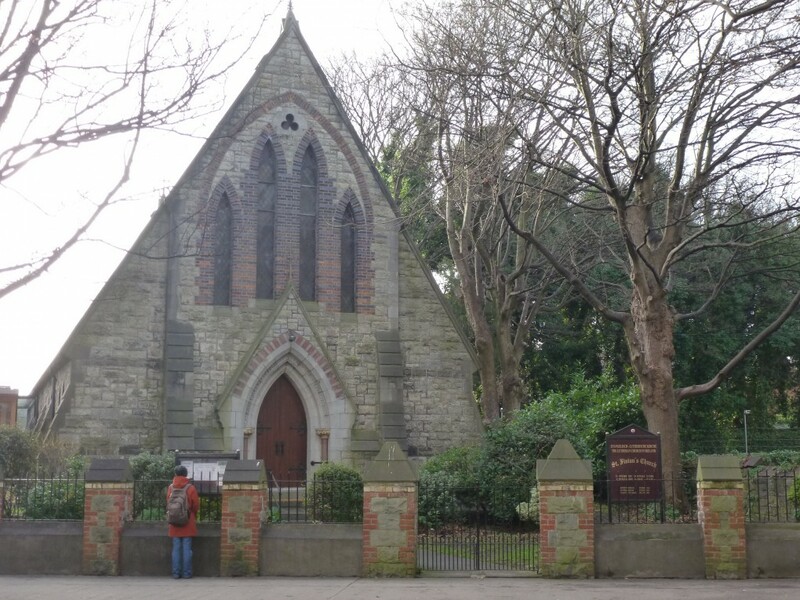 The Lutheran Church in Ireland uses the Moravian Church University Road in Belfast since thirty years for a Service in German language every last Sunday of a month and ist very grateful for this act of hospitality. Some of you know me from the Odenwald Church Radio “B46”. I’m happy to continue with my “career” “on air”: today Domradio Köln called me for an interview, last week the Bayerischer Rundfunk: great fun – and hopefully my Brexit – Stories are interesting. The pic shows me as radio moderator in the Odenwald, ages ago. Special greetings to the former Radio-B46-Team!!! 10th November 2018: More than 100 Children and parents joint us in St. Finian’s Church for the Martin’s Service: “Carry the light into this world” was one of the songs, commemorating St. Martin, who shared his cloak with a beggar. Today, 11th November 2018: 100 years ago WW I came to its end. With the war the strong connection of throne and altar died, and in WW II the connection of God and one Nation died in the gunfire: God is the light and the peace, he can’t be captured by nationalism or by the rulers of the world. Carry the light into the world – the children did that yesterday. And they brought light, laughter and some money to a homeless man sitting there where we passed by.